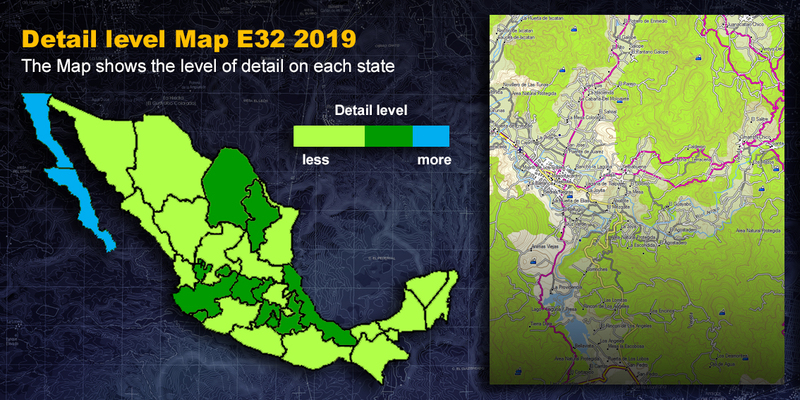 Since 2014 Update the Map E32 has the most emblematic routes for OFF ROAD in Mexico. If you live in the US or Canada we know how much you like ride in Baja and Copper Canyon so we paid special attention to these 2 regions and added around 30 routes for the Baja and around 20 for the Copper Canyon. All the routes were mapped with a GPS so you can be certain that someone else traveled it, however we are not responsible for blocked roads, private property or natural changes in terrain. Routes are marked in Magenta. No other map of Mexico contains these OFF ROAD Routes. Existing roads and highways were corrected. Roads and highways that were missing were traced. Overpasses and road junctions and avenues were detailed. Airports and airstrips were detailed. The trace of the railway was corrected. Major rivers, water bodies and river deltas were detailed. North Baja and South Baja now have more detail (no other map has this kind of detail) Jalisco, Puebla, Coahuila, Aguascalientes and Colima were also updated. 95% of the dirt roads and trails of these states were traced (that means thousands! ), all water bodies like lakes , ponds , flood zones , missing Dams were traced. 95% of rivers and water channels was traced. Roads and highways have corrections. North Baja and South Baja now have more detail (no other map has this kind of detail) Nuevo Leon, Puebla, and Coahuila also were updated. 95% of the dirt roads and trails of these states were traced (that means thousands!) , all water bodies like lakes , ponds , flood zones , missing Dams were traced. The Map E32 now has 280 ROUTES for OFF ROAD, mountain Biking, and Trekking. The Map E32 now has 250 ROUTES for OFF ROAD, mountain Biking, and Trekking. Routes are marked in Magenta. *No other map of Mexico contains these OFF ROAD Routes. Near 80% of the state dirt roads and trails were traced. Bodies of water such as lakes, lagoons, flood zones, dams, etc. were traced. Near 80% of rivers and water channels were traced. 95% of the dirt roads and trails of these states were traced, all water bodies like lakes, ponds, flood zones, missing Dams were traced. We added 30 ROUTES for OFF ROAD, mountain Biking, and Trekking. More than 80% of the state dirt roads and trails were traced. More than 80% of rivers and water channels were traced. We added around 100 of the Best OFF ROAD ROUTES in Mexico. The 2014 Update has the most emblematic routes for OFF ROAD in Mexico. All the routes were mapped with a GPS so you can be sure that someone else traveled it. We added around 10,000 gas stations in all Mexico. We added around 500,000 points of interest throughout Mexico such as hotels, restaurants, etc. Major rivers , water bodies and river deltas were detailed. 95% of the dirt roads and trails of the states were traced all water bodies like lakes , ponds , flood zones , missing Dams were traced . Missing roads and highways were traced. Underpasses, junctions and avenues were traced. Airports and landing strips were detailed. Tracing for railroads was corrected. Main rivers, deltas and bodies of water were detailed. *A new polygon was added for the snow areas. The coastline for the mentioned states was detailed. *An extra level was added, so that a high zoom level, only state lines, oceans, roads, state names and capitals are visible. DURANGO, ESTADO DE MEXICO, GUERRERO, MICHOACAN, OAXACA, PUEBLA, QUINTANA ROO, TLAXCALA, TABASCO, YUCATAN AND ZACATECAS. Countour lines every 30 meters were added for he whole country. Names for thousands of towns and ranches were added. The type and thickness of the lines used for gaps and trails was visually improved to better identify them. The country was devided into 494 regions because of how big the map was as a result of the information added. - OVER 80% OF NUEVO LEÓN Y QUERÉTARO'S GAPS AND TRAILS WERE TRACED. - THE MAP GREW FROM 240 MB TO 800 MB APROXIMATELY. Main rivers and bodies of water were detailed. Polygons for farm areas were visually improved with a more pleasant color. Projection of contours according to zoom level was improved. Subdivisions and neighborhoods from every city in Mexico were added. About 400,000 points of interest all over the country were added, such as: sports areas, cemeteries, bus stations, shopping malls, cultural centers, entertainment centers, buildings, schools, hospitals, churches, markets, government offices, municipal offices, squares, monuments and banks. Aproximately 11,000 traces for rivers and streams were corrected and added all over the country. The polygon for seas was visualy extended. The tracing for main bodies of water (lakes and dams) was corrected. INCREDIBLE DETAIL, 5 STATES WERE PRIVILEGED... THERE'S NO MAP ON THE MARKET THAT CAN COMPARE! - The map contains over 250 cities with street and avenue names. - 100,000 paths for dirt roads and trails in the country were added. - The search function for streets and crossroads was enabled for all Garmin GPS devices. - Search for addresses or crossroads from the 250 cities by entering data such as STATE / CITY / STREET and the screen shows were the street is located. - Every state is an individual map. - Dirt road visualization was improved. - 100,000 paths for gaps and trails in the country were added.